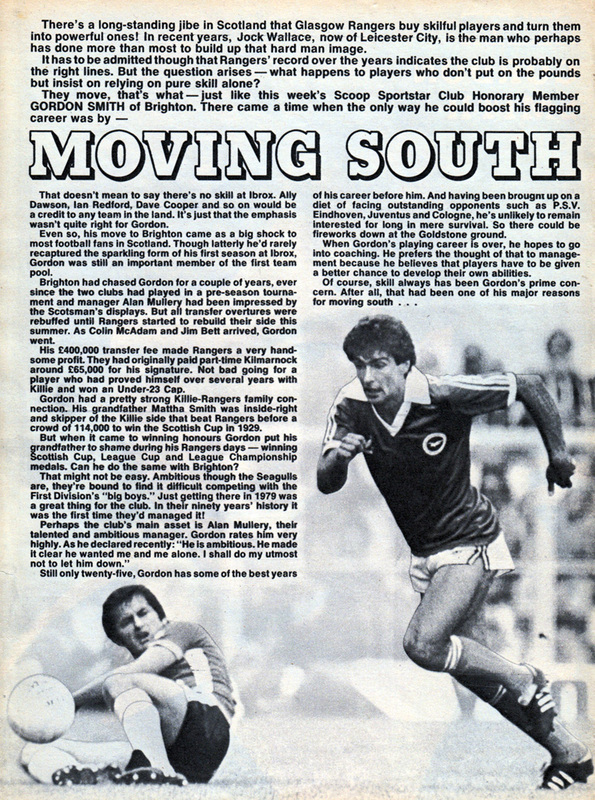 This feature in Scoop magazine on Gordon Smith came in 1980/81, after he had completed his move from Rangers to Brighton. It doesn’t seem as if they had direct access to the Scottish attacker, but the article makes for an interesting read nevertheless. I’m sure he feels privileged about being a Scoop Sportstar Club Honorary Member! There’s a long-standing jibe in Scotland that Glasgow Rangers buy skilful players and turn them into powerful onest in recent years, Jack Wallace, now of Leicester City, is the man who perhaps has done more than most to build up that hard man image. It has to be admitted though that Rangers’ record over the years indicates the club is probably on the right lines. But the question arises – what happens to players who don’t put on the pounds but insist on relying on pure skill alone? They move, that’s what – just like this week’s Scoop Sportstar Club Honorary Member Gordon Smith of Brighton. There came a time when the only way he could boost his flagging career was by moving south. That doesn’t mean to say there’s no skill at Ibrox. Ally Dawson, lan Redford, Dave Cooper and so on would be a credit to any team in the land. It’s Just that the emphasis wasn’t quite right for Gordon. Even so, his move to Brighton came as a big shock to most football fans in Scotland. Though latterly he’d rarely recaptured the sparkling form of his first season at Ibrex, Gordon was still an important member of the first team pool. 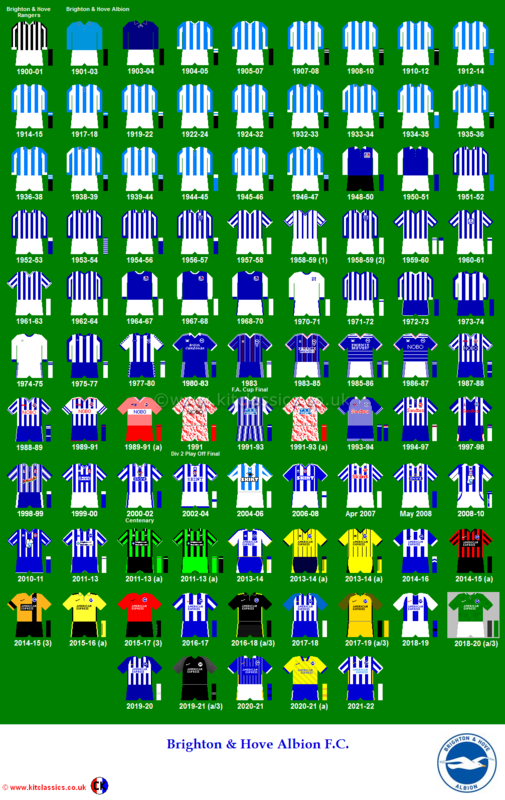 Brighton had chased Gordon for a couple of years, ever since the two clubs had played in a pre-season tournament and manager Alan Mullery had been impressed by the Scotsman’s displays. But all transfer overtures were rebuffed until Rangers started to rebuild their side this summer. As Colin McAdam and Jim Belt arrived, Gordon went. His £400,000 transfer fee made Rangers a very handsome profit. They had originally paid part-time Kilmamock around £65,000 for his signature. Not bad going for a player who had proved himself over several years with Killie and won an Under-23 Cap. Gordon had a pretty strong Killle-Rengers family connection. His grandfather Mattha Smith was inside-right and skipper of the Killie side that beat Rangers before a crowd of 114,000 to win the Scottish Cup in 1929. But when it came to winning honours Gordon put his grandfather to shame during his Rangers days – winning Scottish Cup, League Cup and League Championship medals. Can he do the same with Brighton? That might not be easy. Ambitious though the Seagulls ere, they’re bound to find it difficult competing with the First Division’s “big boys.” Just getting there in 1979 was a great thing for the club. In their ninety years’ history [seventy eight, actually!] it was the first time they’d managed it! Still only twenty-five, Gordon has some of the best years of his career before him. And having been brought upon a diet of facing outstanding opponents such as P.S.V. Eindhoven, Juventus and Cologne, he’s unlikely to remain interested for long in mere survival. So there couM be fireworks down at the Goldstone ground. When Gordon’s playing career is over, he hopes to go into coaching. He prefers the thought of that to management because he believes that players have to be given a better chance to develop their own abilities. 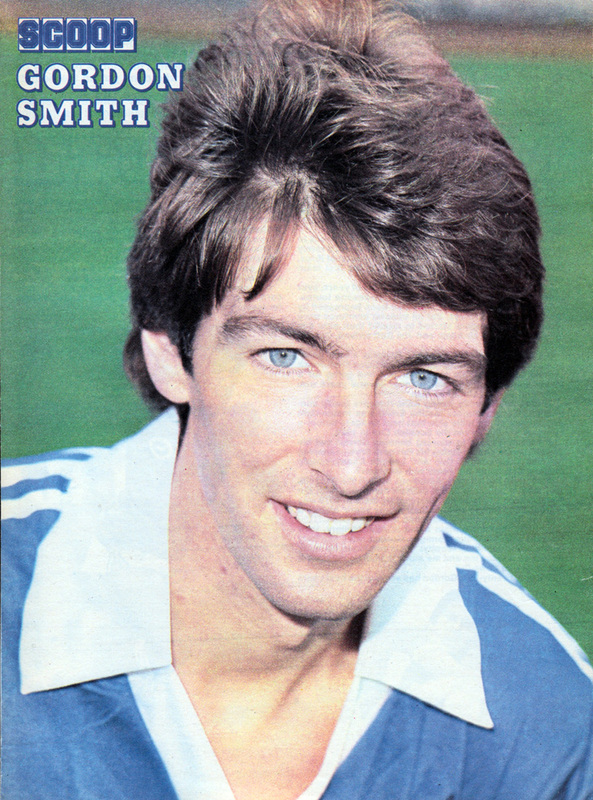 Smith certainly made a quick impact, scoring the opening goal in the 2-0 victory over Wolves on the opening day of the 1980/81 season. Thriving in a free role behind the strikers Ward and Robinson, he enjoyed a purple patch in front of goal, hitting the target seven times in just nine League matches, including a famous hat-trick at Coventry when Albion stormed back from 3-0 down. I had scored ten goals from midfield that season, which was quite a good return for a midfielder at that level. For me, it had been a good season – we had stayed up, I felt I had made a significant contribution to the cause and I was getting on well with the manager. Then two weeks later, things changed dramatically. Mullery resigned, Bailey was brought in, and Smith found himself out of favour.